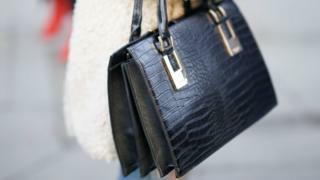 Selfridges has said it will ban the sale of exotic animal skins such as alligator, crocodile and python. From February 2020, the luxury London department store will only sell leather from agricultural livestock. The Humane Society International said the move was the "natural next step for a responsible retailer" and would save "countless" crocodiles and snakes. People for the Ethical Treatment of Animals (Peta) has urged rival stores, such as Harvey Nichols, to follow suit. Yvonne Taylor, director of corporate projects at Peta, told BBC News: "Hats off to Selfridges - which had already banned fur, angora, and foie gras after persuasive talks with Peta - for now ending the sale of wild animals' 'exotic' skins." The industry is not only "heartless", but "extremely wasteful", Peta claims, saying it can take the skins of four crocodiles to make a single bag. The BBC understands that the ban will mainly affect sales of very high end, expensive accessories, particularly shoes and handbags. The move follows an announcement from designer Victoria Beckham that she would stop using exotic skins in her designs from her autumn/winter 2019 collection onwards. Beckham joins Vivienne Westwood, Diane von Furstenberg and Chanel in the ban - alongside high street brands such as Topshop, H&M and Adidas. In December, Chanel became the first luxury fashion house in the world to stop using exotic animal skins. The company's head of fashion, Bruno Pavlovksy, said it had become harder to source such skins ethically. Meanwhile, British designer Stella McCartney's "vegetarian brand" has never used leather, skin, fur or feathers. The brand uses leather alternatives such as recycled polyester instead of Brazilian calf leather - which it claims has a high environmental impact. Selfridges, which banned the sale of fur in 2005, said banning exotic skins was part of a "long-standing commitment to place ethics and sustainability at the heart of commercial decisions". Selfridges' buying director Sebastian Manes said the brand was fixed on being at "the very forefront of future thinking retail". He added: "For us, that's a future where luxury is defined by craftsmanship and material innovation." In 2015, the store removed single-use plastic water bottles from sale and made its signature yellow paper bags from recycled coffee cups. Since the beginning of this year, all clothes bags have been made with used plastic bottles. In the charity sector, the British Heart Foundation will not accept real fur or fur-trimmed items, or anything made from ivory. Oxfam told the BBC it does not sell products made from crocodile or alligator skin, angora wool or fur. It also checks legal regulations for items made of snakeskin, tortoiseshell and coral, and will only sell ivory if it can be proven that the product was made before 1947. Peta's Ms Tayor said conscientious and informed consumers "absolutely reject the exotic skins trade, which invariably torments and kills crocodiles, snakes, lizards, and other sentient, beautiful animals in appalling ways for fashion". She added: "Peta urges other department stores, like Harvey Nichols, and brands such as Louis Vuitton to follow Selfridges' business-savvy example." A spokesperson for Harvey Nichols told the BBC: "Harvey Nichols requires any brand that uses fur or exotic skins to adhere to the Animal Sourcing Principles as set out by the Responsible Luxury Initiative (ReLi)". The ReLi claims to have set "high level principles" for the sourcing of leather, fur and exotic skins, but Peta maintains that there are "few laws" to protect reptiles from abuse. According to Peta the illegal trade in exotic skins is "rampant" - with an estimated US $1bn worth of python skins imported into Europe illegally each year. The group also claims that many of the millions of reptiles whose skins are exported from Southeast Asia each year belong to endangered species, whose numbers in the wild are "drastically dwindling". Department store John Lewis told the BBC that it does not sell any products with exotic animal skins.